To see an example of an inline link, click on this link right here. Instead of opening up a new browser window, the article appears in a modal window. Note: this is only available in the ScreenSteps knowledge base (e.g. not available for the Zendesk integration). You can add an inline link using either the desktop editor or the web editor. Important: Inline linking is available in desktop version 4.0.8 build 466 or later. You can download the latest version here: Download the desktop editor. 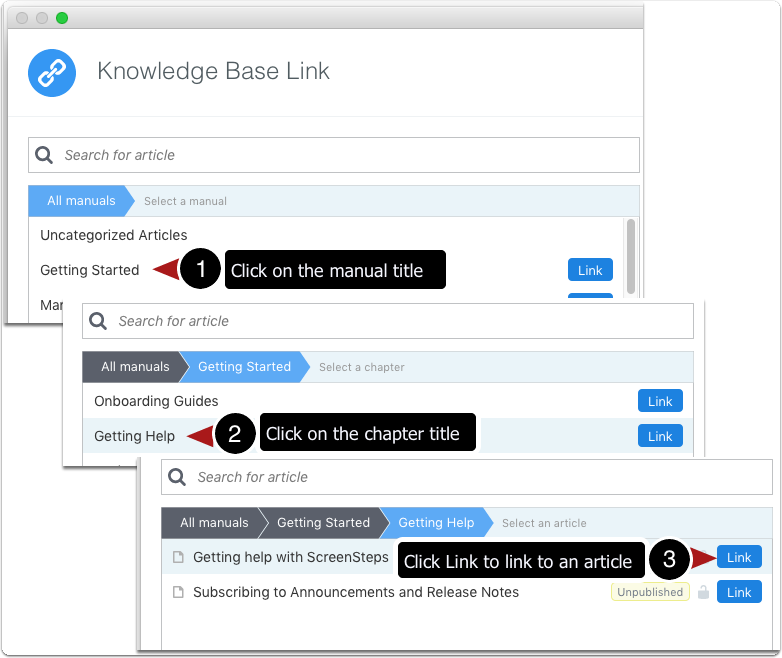 You cannot create an inline link to a manual or a chapter. You can only create an inline link to another ScreenSteps article. You can also search for an article title. When you locate the article, click Link next to the title, same as you would normally do. After you select the article, make sure to 1) click the inline option before you 2) finalize the link.